The official SANA news agency said at least 140 people were also injured when a suicide bomber in a vehicle blew himself up in a western neighborhood of the city. Britain-based Syrian Observatory for Human Rights said the initial attack had caused a gas tank to detonate. The area targeted houses several ministries of the local autonomous Kurdish administration. 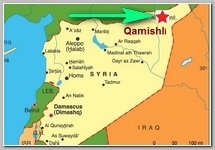 In a statement published by the I.S.I.S-linked Aamaq news agency, the group said it carried out the attack in Qamishli, describing it as a truck bombing that struck a complex of Kurdish offices.